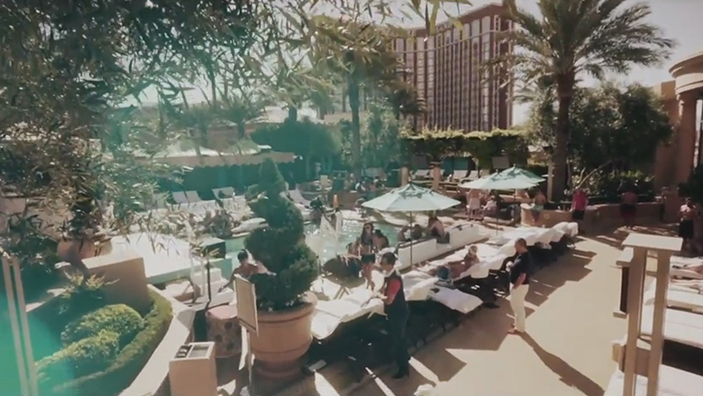 Directly on the Las Vegas Strip sits Azure Pool, an exclusive pool experience featuring cabanas, daybeds, a light food menu, cocktails, and bottle service – all in a sophisticated atmosphere. Spend the day lounging on one of the 15 comfy daybeds or sit back in one of the 26 lounge chairs with optional umbrellas. When you get too hot, cool down with a dip in one of two swimming pools, or take a soak in the rejuvenating jetted hot tub. No matter where you end up, you’re sure to have a good time. If you plan on spending the day, you’ll want to splurge on one of the venue’s 11 private cabanas. Each of these elegant, private spaces are equipped with a flat screen television, air conditioning unit, couch and four lounge chairs, refrigerator stocked with cold water, video game access, and much more. Upon entry, you’ll also be offered amenities like Hawaiian Tropic sunscreen, Evian misters, and fresh fruit to help keep you comfortable and enhance your overall experience. If you get hungry as you’re lounging, socializing and relaxing, get a little food and drink from the bar. In addition to traditional bottle service, Azure also serves specialty cocktails from a unique mixology menu at their premium bar. Also available is a menu of gourmet snacks created by Wolfgang Puck. Open in the spring, summer and fall, there’s no better place to spend the warmer months of the year then by the poolside with a drink in hand. 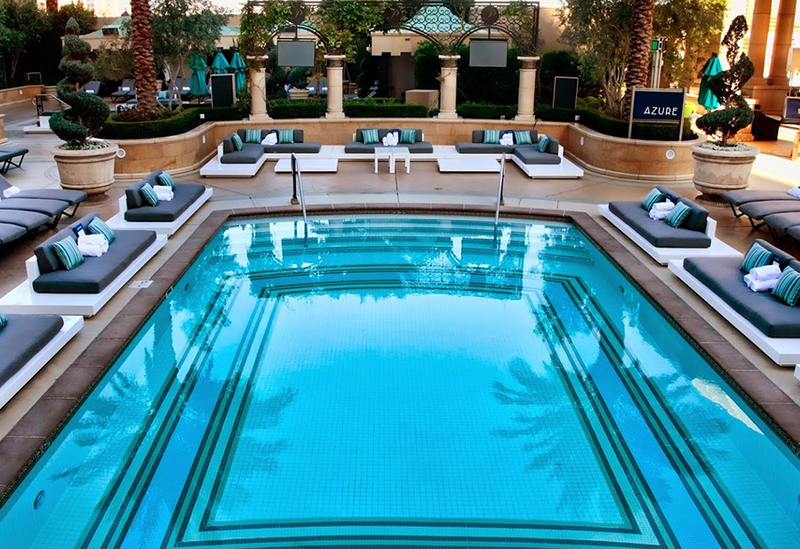 Like other upscale Las Vegas establishments, Azure Luxury Pool offers the finer things in life. With a stylish design, sophisticated décor, lush greenery, and seasonal florals, the atmosphere is vibrant and lively. The venue has hosted many performers and DJs over the years, and has seen the likes of big name celebs like Ryan Lochte, Jennifer Love Hewitt, and Wilmer Valderrama. Throughout the day, there is a DJ playing full time, which adds extra energy to the ongoing party. 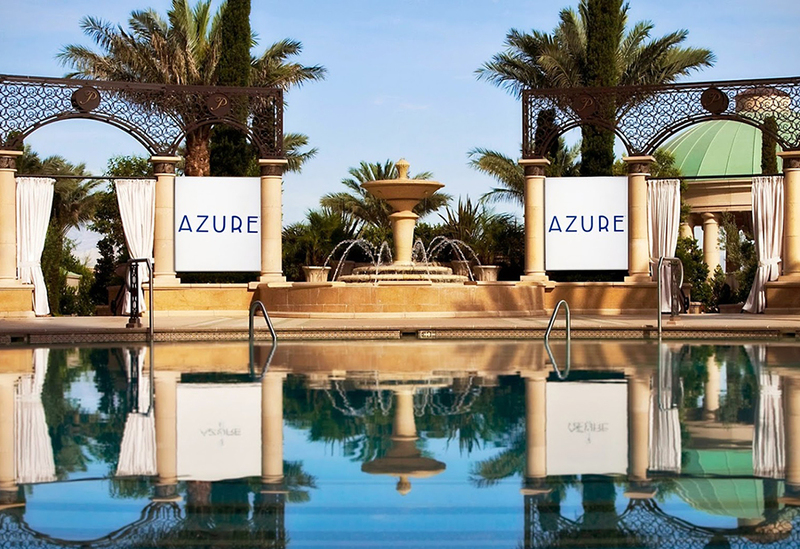 Azure can be found at the famous Palazzo and welcomes adults age 21 years or older. There is a $20 cover charge but locals with a Nevada ID will receive complimentary admission. 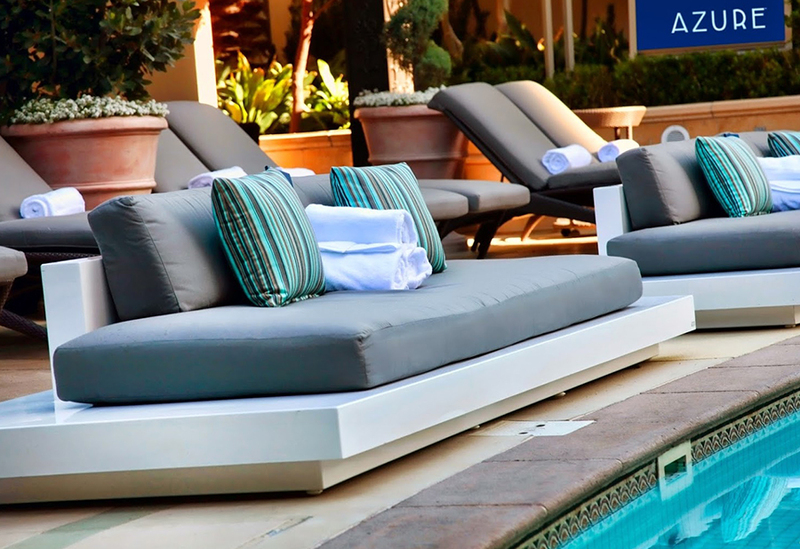 If you’re interested in getting a cabana, daybed or lounge chairs, you’ll need to call ahead to reserve your spot. If you’re looking to splurge on a memorable day out on the town, consider bottle service. Have endless bottles and mixers brought directly to your cabana to create your own intimate party. From champagne and frozen grapes to chilled towels and poolside massages by Canyon Ranch SpaClub, you’ll want to spend every day by the pool. The venue embodies sophistication at its finest, leaving guests coming back again and again. 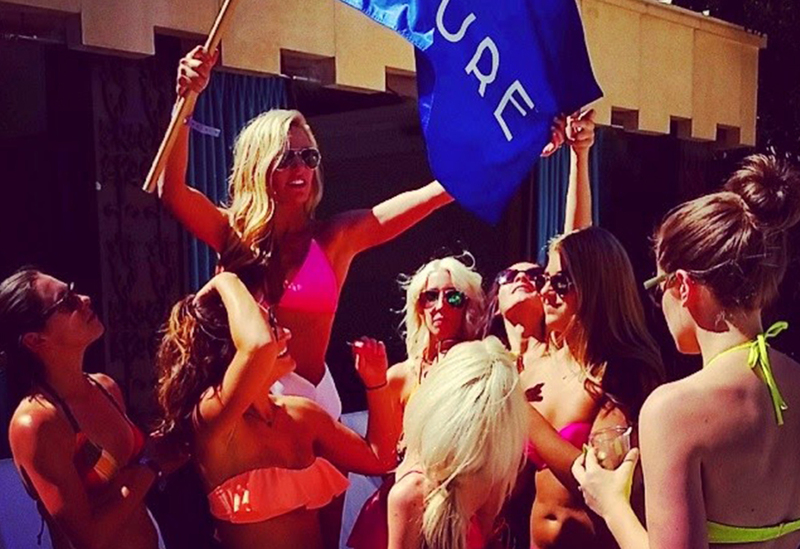 Azure is the perfect place for those who desire a busy pool party without the craziness of other local Vegas clubs. The upscale oasis offers the ideal combination of relaxation, entertainment, and great amenities all rolled into one great day by the poolside. 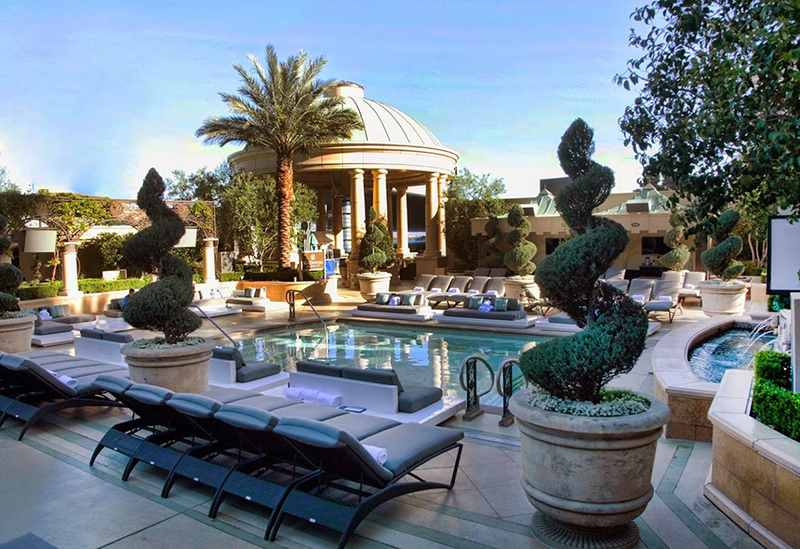 Between The Venetian and The Palazzo you’ll find 10 pools and 5 hot tubs over a five-acre deck. Heated pools are also available during the colder months. The pools can be found at varying depths, starting with the Lounge Pool which has a water level of just over one foot, allowing you to easily soak after a long day in the sun. Cocktail service and a center bar are available for easy access to chilled beverages all day long. Private showers and changing rooms can also be found on The Palazzo Pool Deck. 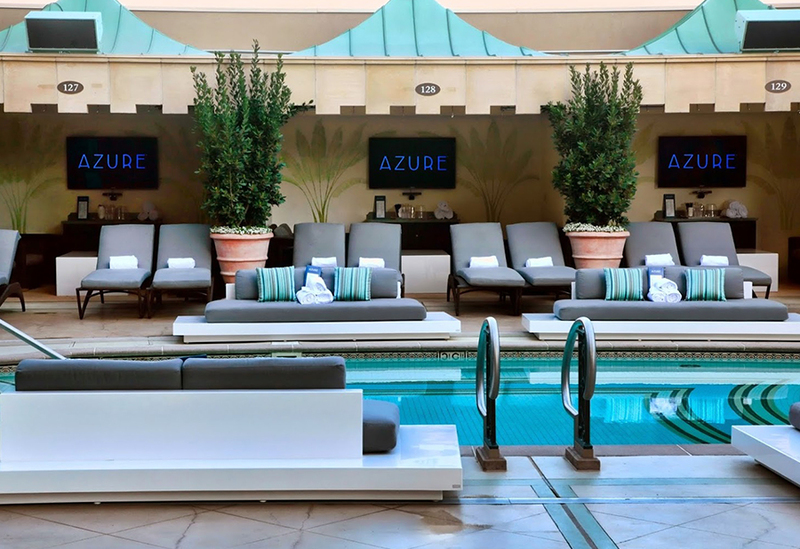 For a memorable day out in Las Vegas, visit the Azure Luxury Pool. 5.0 on Feb 20, review by Audrey H.